Through a solid partnership, the Geelong Community Foundation and Adroit Insurance & Risk have raised over $1,000,000 for the local community. Together the Geelong Community Foundation (Foundation) and Adroit Insurance & Risk (Adroit) have cultivated a genuine relationship, where Adroit’s passion and enthusiasm to create a real, lasting difference for the Geelong community combined with the Foundation’s expertise, has sought to deliver to the local community an outstanding difference. Adroit is proud of their origins, dating back to 1978 originally a small broking firm in Geelong. After three and a half decades of rapid organic and acquisition growth, Adroit built a network and 9 branches across regional and metropolitan Victoria. events, and countless hours of volunteering by their people. Adroit has been recognised nationally in 2018 when they won the ‘Best Community Engagement Program’ at the Insurance Business Awards. Their approach to partnering with community foundations and key achievements through the partnership with the Foundation contributed towards the win. The relationship between the organisations was first established in 2006 when the Foundation came onboard as the Community Partner in the Adroit Charity Golf Day. This event has grown to one of the largest in the Geelong fundraising calendar and raised over $1,000,000 for local causes. Since then their relationship has seen the creation of two Named Sub Funds – The Adroit Golf Day Sub Fund which contains proceeds from the Charity Golf Day and the Adroit Insurance & Risk Sub Fund growing from financial contributions made by the company. The provision of office space amongst other various assets allowing the Foundation to run at minimal cost, maximising the funds that are donated back into the community. 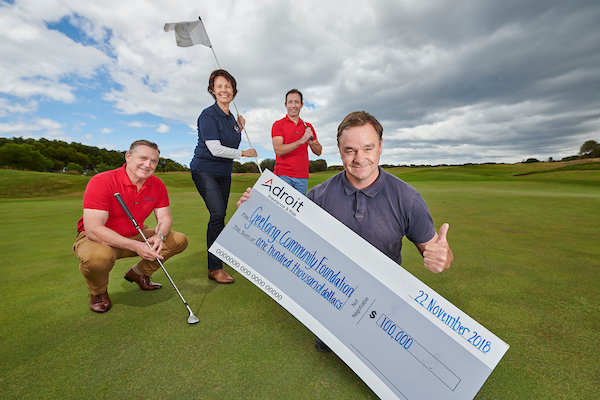 In 2017 the Adroit Charity Golf Day Grant was launched, with the opportunity for all community organisations in the Geelong region to apply for a $100,000 capital grant. The grant was developed to ensure the funds from the day made a lasting impact via a capital project. This not only allowed Adroit to go from being reactive to proactive in sourcing a cause but allowed local charities to plan ahead and realise a project that potentially would have been out of reach could be possible. Adroit’s partnership with the Foundation utilises their expertise to choose a sustainable, suitable charity for the grant that will leave a lasting effect on the community. Adroit Insurance & Risk Executive Director Andrew Locke joined the Foundation’s Board of Directors 18 months ago and his strong connection to community service translates into the business. The support of the community is the reason Geelong is a very special place to be.